Sarel J. Fleishman, Andrew Leaver-Fay, Jacob E. Corn, Eva-Maria Strauch, Sagar D. Khare, Nobuyasu Koga, Justin Ashworth, Paul Murphy, Florian Richter, Gordon Lemmon, Jens Meiler, and David Baker, RosettaScripts: A Scripting Language Interface to the Rosetta Macromolecular Modeling Suite, PLoS ONE 6(6), 1-10 (2011). Nobuyasu Koga, Rie Tatsumi-Koga, Gaohua Liu, Rong Xiao, Thomas B. Acton, Gaetano T. Montelione and David Baker, Principles for designing ideal protein structures, Nature 491(7423), 222-227 (2012). 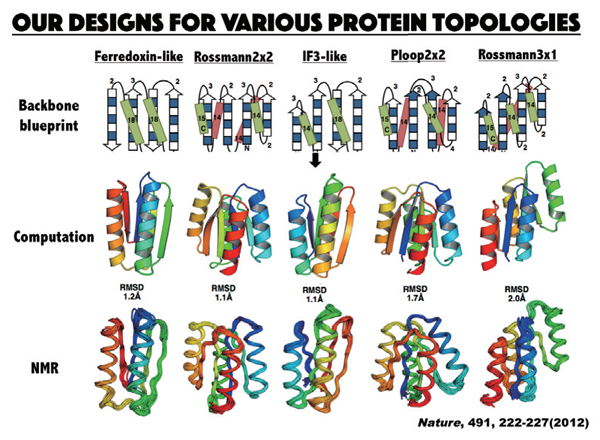 novo designed proteins, Proc. Natl. Acad. Sci. USA 112(40), E5478-5485 (2015).